USS Constitution, then and now. 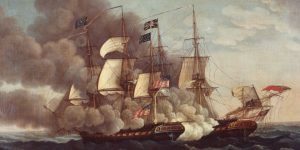 The first painting is Action between USS Constitution and HMS Guerriere, 19 August 1812, by Michel Felice Corne. 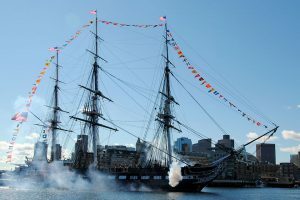 The second picture is courtesy of the US Park Service, and shows the Constitution during the 2014 Independence Day celebrations at Boston Harbor.